The Salem-Keizer School District (SKSD) is already planning how it might revamp the McNary High School campus in 2019 if a new bond measure passes next year. That may sound like putting the cart before the horse, but the cost of what might be a massive project is a factor. “We are moving forward as if the bond will pass because, if we don’t it, it will delay the whole program and cost $30 million more. It makes sense to do that prep,” said SKSD Chief Operations Officer Mike Wolfe. 1. Expansion of administrative offices (970 square feet) to accommodate additional staff needed to serve larger student population. 2. Career Technical Education (CTE) addition supporting one large, and one small CTE program area (9,000 square feet), as well as replacement classrooms (CTE and other) for those lost in the demolition (17,200 square feet). 3. Flexible learning space (2,500 square feet) and science lab with prep area (1,625 square feet). 4. General Classrooms (13,020 square feet), Special Education Classrooms & Support (3,938 square feet), Extended Learning and Small Group Areas (2,200 square feet). Wolfe and Principal Erik Jespersen unveiled a conceptual map of potential changes in the works at the school during a community forum at McNary Thursday, Oct. 12. School and city officials called for the forum to deal with the impacts of a growing student body on parking and traffic in the surrounding neighborhoods. “One of the reasons McNary is one of the first in the queue is because of parking issues,” Wolfe said. 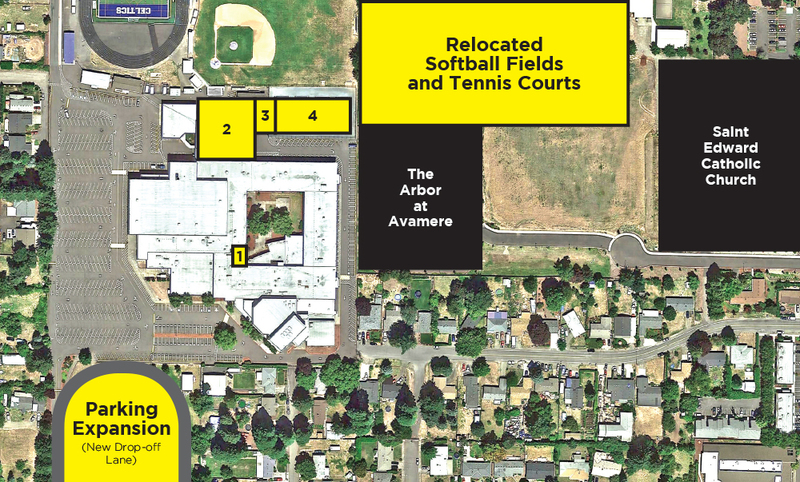 For the past two years, neighbors along Newberg Drive North have voiced complaints to the Keizer City Council and Salem-Keizer School Board regarding drastic increases in school-related traffic and parking on their street. The conceptual map, and the changes it forecasts, hinge on striking a deal for additional land behind St. Edward Catholic Church. School district and church officials are already in talks for an acquisition. If everything goes according to the concept plan, the softball fields and tennis courts would be moved to the field behind the church. The current softball fields would be converted into additional parking and a drop-off loop. New classrooms – for career and technical education, science labs and special education – would be added to the north end of the building. The district plans on assembling a task force of McNary area stakeholders to hammer out specifics of the any redesign if the bond passes. While Wolfe and Jespersen hoped to redirect some of the growing animosity from neighbors along Newberg Drive toward hope for the future, there was plenty of grievance aired throughout the evening. Residents along Newberg argue that closing two other pedestrian gates to the McNary campus – on Sandy Drive and Robindale Drive – have only served to shift the problems to Newberg. “What motivated us was escalating criminal activity. It wasn’t just kids behaving poorly, but interacting poorly with adults living in that area,” Eppley said. During a question and answer session, residents voiced concern regarding lack of respect on the part of parents using Newberg to drop off their students, the lack of sidewalks and street lights along Newberg Drive and the lack of a signalized intersection at the entrance to the school on Lockhaven. The most resounding moment of the proceedings came when a resident of Newberg Drive asked the residents of Robindale and Sandy in attendance what should be done. “Close the gate,” was a near-unanimous refrain. While it was the consensus of the audience, Wolfe said it wasn’t something the school would act on immediately. “The more barriers that we can remove for students getting (to school) is one of the things we have to balance,” Wolfe said. Some of the solutions proposed included expanding the number of parking passes sold, having staff park off campus and shuttled in, creating park-and-ride areas for students to utilize public transportation, posting campus monitors at the gates and opening all three during drop-off and pick-up times, and having a Keizer traffic patrol officer stationed at the Lockhaven entrance during drop-off to keep traffic flowing. The sheer number of complaints and potential solutions was illustrative of the size of the problem, Jespersen said. “If every person in this room was passionate about the same solution, we would do it,” he said. The one idea that seemed to find some favor with the officials in attendance was opening the school to students earlier. Currently, the school doors open at 7 a.m. and the first class begins at 7:35 a.m. Opening the doors earlier might spread the number of cars utilizing Newberg over a longer time frame and reduce bumper-to-bumper jams. While much of the discussion focused on student activity and expectations, some in attendance felt that students should not be blamed, or punished, for the actions of parents. “I feel like it’s the parents who are most disrespectful as far as traffic goes. How do we get them involved in whatever happens with this situation? They need to be good neighbors,” said one resident.